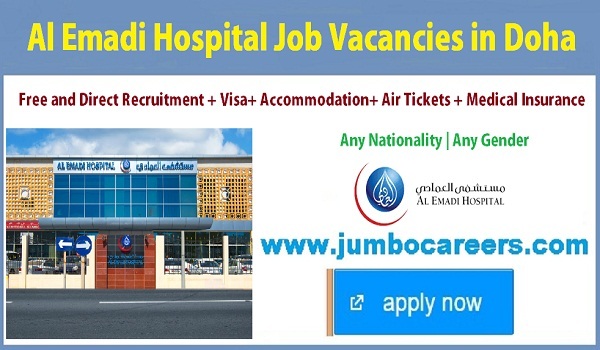 Leading private hospital in Doha Qatar- Al Emadi Hospital hiring Staff. Latest Hospital Vacancies in Doha includes Nurses, Technicians, Therapists, Accountants, Drivers, Sales and maintenance supervisors. Its a free and direct recruitment by the company. About Al EMadi Hospital Qatar: Al-Emadi Hospital was established in 2004 by prominent surgeon Dr Mohamed Al-Emadi as a private, acute care, general (medical/surgical) hospital whose mission is to deliver comprehensive medical services and healthcare, guided by the highest international standards. In addition to the Emergency Department, the hospital provides inpatient and outpatient services. Al EMadi Hospital outpatient clinics cover General Surgery, Plastic Surgery, Pediatrics, ENT, Ophthalmology, Orthopedics, Internal Medicine, Cardiology, Neurology, Dermatology, Dentistry, Pulmonology, Obstetrics & Gynecology, Urology, Rheumatology and Diets & Nutrition, Laboratory, Emergency, and Pharmacy.